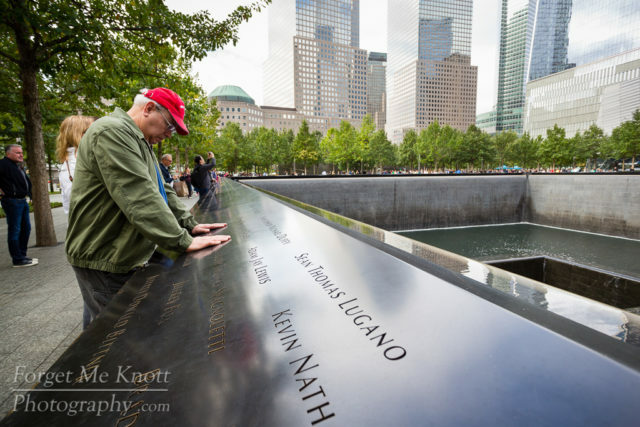 Along the edges of the two reflecting pools are large granite slabs with the names of the nearly 3,000 victims. Thirty foot waterfalls line the inside of the pools, designed to drown out the city noise pollution with the intention of making the 9/11 memorial a contemplative sanctuary. I think it is a success. This image caught me by surprise. At the time I shot it I was just shooting an abstract of the names and the pool but when I got home and started processing these images I immediately noticed the reflection of two buildings. Just to make sure I wasn't creating something out of nothing, I asked my wife what's the first thing she sees in this image. She said the Twin Towers. Just as I had seen now - the Twin Towers reflecting on the victim's names. I call it the "Ghosts of the Twin Towers". 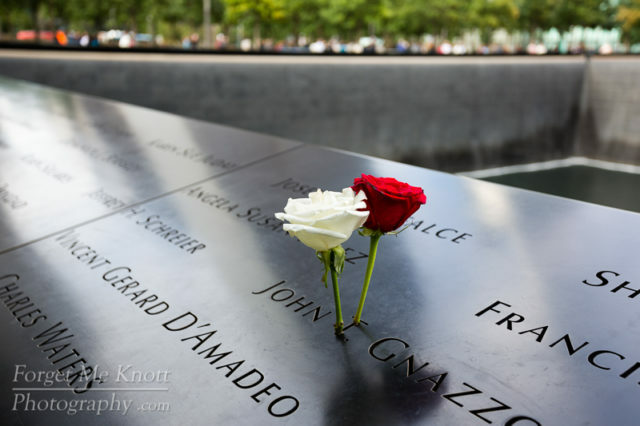 There were many names with roses or flags placed on them. They invoked an obvious emotional response from onlookers. It somehow made those names come to life as if we could suddenly connect with them. They were more than just inscribed names. After I took in the sights myself, I turned to the other visitors. There were hundreds of others there, each with their own 9/11 story. Each with their own memory. 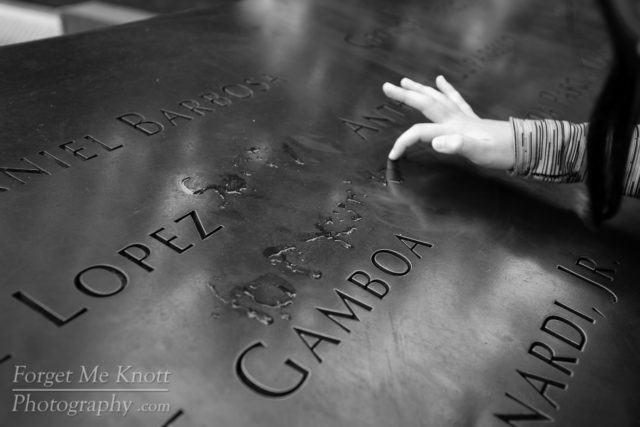 There was a man with both of his hands on one of the memorial's name panels. 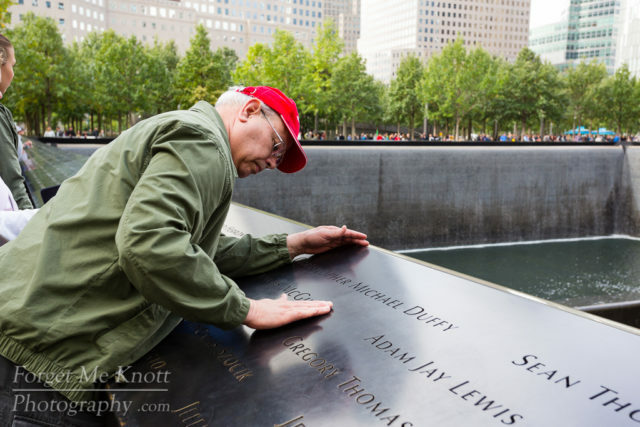 He was running his fingers over and over the engraved names of those who perished in 9/11. He was engrossed in it. He was completely present in the moment, oblivious to the hoards around him. What was he thinking? Did he know them? Did he just empathize with them? That's when it got a little personal for me. 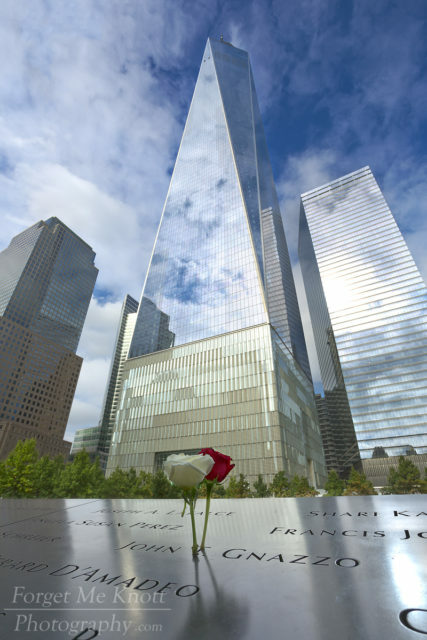 It shifted from a beautiful and solemn architectural attraction to a legitimate memorial. The one that really hit me was this young girl. She dipped a finger in the pool's water and wrote on the name panel "Sorry for your loss". That's when it hit home. She took the time to retrace each letter so it was legible. Her father must have seen my tears while I was taking photos of her. He gripped my shoulder and gave a squeeze. We shared a glance and a nod. As they walked away the young girl stopped, looked at me and said, "I hope it doesn't happen again." I had no response. What do you say to that? Did we learn how to love each other and our differences yet? Have we recognized our oneness? I fear not. This mother was explaining what happened on 9/11 to her two young boys. She was playing videos on her phone for them. I can only imagine trying to process that. Also at the memorial is the 9/11 Memorial Museum. 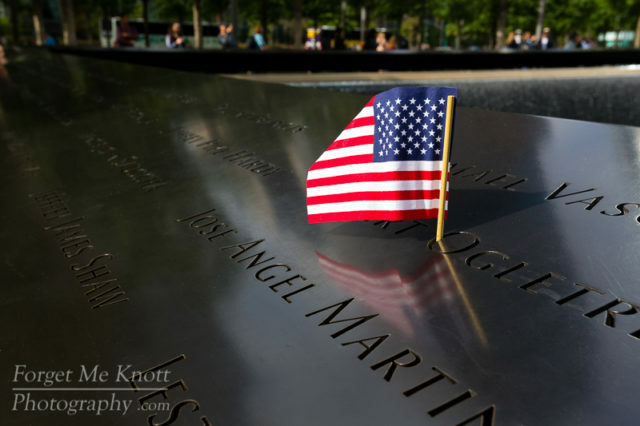 While the memorial is free, the museum has a fee involved but is well worth it. I managed to snap one image inside the museum before security shut me down...no photos inside. Inside the museum (which is basically inside the foundation of where the Twin Towers were) you'll find many exhibits including, damaged fire apparatus, recordings of victims voice messages before they perished, a collection of unique photos, and several pieces of the towers including the last standing column (among much, much more). Expect to spend at least a couple of hours in the museum. And also expect to relive those emotions, if not for the first time. 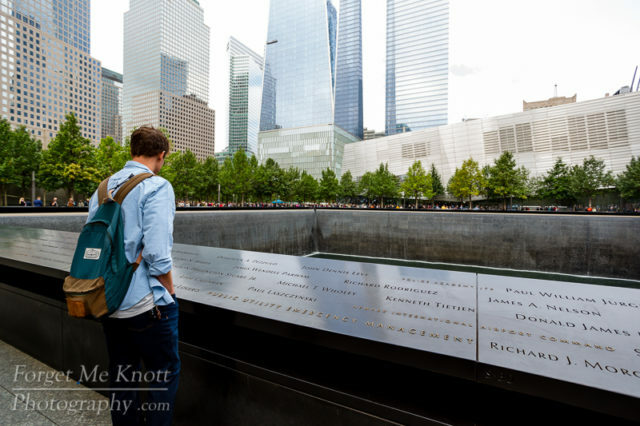 All in all I think New York did a great job with the 9/11 memorial and is a must visit.